Welcome in my Indonesian foods blog's, will be better if you see this blog using Mozila Firefox browser. Has been known that many types of typical dishes from Indonesia, from the east end till the west end and from the north end till south end, I try to write for share some Indonesian food and recipes for cooking. Hopefully this article is useful and add insight about the variety of food available in Indonesia. Membuat low fat fudge brownies. Cairkan coklat masak dengan cara di-tim. Sisihkan dan dinginkan suhu ruang. Campur rata putih telur, pisang, gula palem, garam dan coklat masak menggunakan mixer kecepatan tinggi sekitar 3 menit. Masukkan terigu dan kocok dengan mixer kecepatan rendah sampai tercampur rata. Tuang adonan dalam cetakan brownies berukuran 22 cm. Taburi bagian atas adonan dengan oatmeal dan potongan buah cherry. Panggang pada suhu 180oC sekitar 30 menit. Anda dapat menggantikan buah cherry dengan buah yang lain seperti potongan buah nangka, kismis atau buah kering lainnya. Anda dapat bereksperimen menggantikan buah pisang dengan pepaya untuk mendapatkan citarasa yang berbeda. Jenis oatmeal yang dapat anda gunakans sebagai topping yaitu oatmeal instan, quick cooking oatmeal, atau rolled oat. 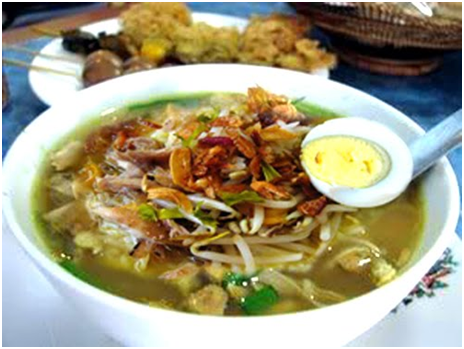 "KUDUS" is the city name in Central Java, Indonesia and one of the famous food is SOTO KUDUS. 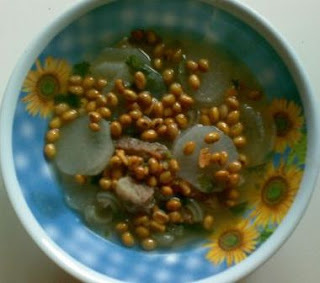 To make SOTO KUDUS is as follows. Cut the chicken into 2-4 parts . Enter into a pan of water, add salt, boiled until boiling . Reduce heat, continue to cook until the chicken is tender. Remove the chicken and drain. Measure the broth and save about 7 ½ cups . Fried the Chicken in plenty of cooking oil until the color is yellowish. Remove and drain. Shredded chicken and set aside. Saute ground spices, enter bay leaf. Stir until fragrant, remove from heat and insert it into the broth. Boil the broth and cook until quite mature, and lift. Serve while warm soup in serving bowls: put the shredded chicken, bean sprouts, and sliced ​​chives and Sprinkle the sauce of broth on top, then sprinkle with fried shallots and fried garlic. Serve with condiment. 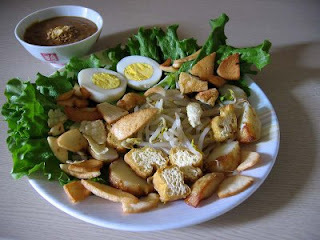 Surabaya gadogado is difference version with gadogado in other places, especially in Jakarta & West Java which use peanut sauce flavor scratched from cobek. 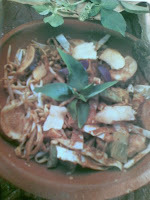 Gadogado Surabaya version using concentrated peanut sauce spices and delicious as it uses coconut milk. As a one dish meal dish is very full nourishing like protein, vitamins, minerals and carbohydrates. Cutting the Lontong (food consisting of rice steamed in a banana leaf). Cutting the fried Tempe (fermented soybean cake). Press rough the Prawn crackers. Emping (fried chips made of Gnetum gnemon fruit). Peeled and slice boiled eggs. Blender fired nuts and use some of measure milk coconut. then mixed with the remaining coconut milk, stir till average & heat while occasionally stirring. While waiting boil, saute the fine spices until well-cooked and put to the stew sauce. Continuing to boil the sauce with a small fire while often stirred up till reduced the volume and look greasy, then put the rice flour solution. Stirring continue until thick and explode around 5 minutes, turn off the fire. Wait until warm, soup is ready. Arrange sequence in the plate : Lontong, Tofu, Tempeh, vegetables, boiled Eggs. Pour with peanut sauce, put shrimp crackers and emping, pour again with a little peanut sauce. Soto Bandung is food such as mayonnaise soup that is unique soup comes from Bandung, West Java. 250 cc of water for boil. 750 grams meat / beef. 100 gr radish, peeled, thinly sliced round. 3 tbsp of oil for frying, for saute. 3 cloves garlic, peeled and contusing. 50 gr galangale, clean, contusing. 3 stick of citronella, contusing. 2 packets of powdered chicken broth. 5 tbsp of fried onion. 100 grs of soybean, submerged less than 2 hours, Drain and Fried. 5 tbsp sliced of celery leaves. Pepper powder, according to taste. * Sambal (Chili sauce with spices). 15 fruit cayenne old, submerged briefly in boiling water, 1/2 tsp salt, 1/2 tbsp sugar, pounded rough. 1 / 2 tsp vinegar. Boil Water, entries meat. Cook while added the water if necessary until the meat is soft. Lift the meat, and cut small. Aside. Saute the garlic until the yellow, input into the chicken broth along with other spices and cutting meat. Boil sliced radish. Cook briefly. Lift. How to serve: Place the pepper powder in a bowl, give lemon taste. Cast thick broth along with the contents, sow fried onion, fried soybeans, sliced onion leaves, and sliced celery. Serve with fried emping, soy sauce and Sambal in separate places. 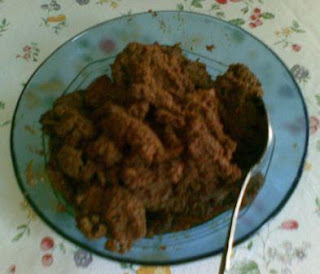 RENDANG is one of the typical foods from Padang (West Sumatra), Rendang is a made from beef, which are given spices. Let's cooked rendang. 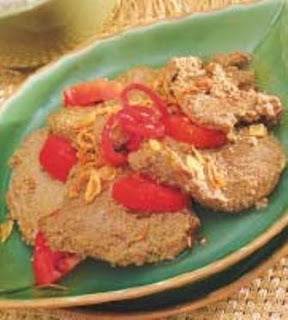 Cut meat/filet with crosswise fiber, thickness 0.5 cm, knocks in order to tender then bedraggling with refined spices and eggs. Aside. Heat the butter/margarine the fried the meat till to brown color. Add water, tomatoes, vinegar, sweet soy sauce and cooking until meat is tender and sauce become a little. Karedok is food from Bandung (West Java), which is made from raw vegetables and peanut flavor. A bit baked Terasi (Blachen = hard shrimp paste). 1. Add together above raw vegetable and take bath with peanut flavor. 2. Serve on plates and add crackers. Call me Gusn, I am Indonesian man and i live in Sidoarjo, Jawa Timur. If you want to know about me, you can seek in my profile or leave a message in this page. Peace all and SAY NO TO DRUGS AND SAY YES TO FOOD. You can subscribe this article every time when you want, hope you enjoy. Thank you averyone.